Cracker Barrel mashed potatoes are some of the best tasting homestyle mashed potatoes you can get in a restaurant. Have you ever wondered what the secrets to the Cracker Barrel Mashed Potatoes might be? I suggest baking the potatoes to make the Cracker Barrel Mashed Potatoes, as the roasting gives these mashed potatoes a really hearty flavor. 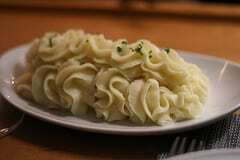 I love a basic mashed potato recipe. These potatoes are simply delicious. These hearty mashed potatoes are simple to make. Cracker Barrel mashed potatoes is a great way to use up old left over baked potatoes. These are so easy to make too. Make mashed potatoes just like Cracker Barrel. Wash potatoes thoroughly, cut into uniform pieces, and drop into salted, boiling water. Cook potatoes until they are fork-tender. Take potatoes out of boiling water and drain. Peel most of the potatoes; make sure you leave about one fifth of each not peeled. Place potatoes into a bowl with the other ingredients and mash the potatoes. I would not use an electric mixer; you do not want to take out all of the lumps. Transfer the whipped potatoes to a serving dish, and serve the mashed potatoes. the potatoes should be started in COLD water not boiling water or they will cook faster on the outside and not the inside. Great tip. I will have to give it a try. this recipe is bolosh (BS). Follow your grandmas recipe and use butter milk. I love their mashed potatoes. How much water to add really depends on how big your pot is. What I do is I cut my potatoes, put them in the pot and add enough water to cover the potatoes by 1/2 to 1 inch of water. The recipe fails to mention taking them to completion. I would agree with Joe after eating there yesterday. They not only taste like instant mash potatoes, they look like instant mash potatoes. They were rather insipid and I even asked the waitress if they were real. She said they were but you could not prove it by me. Cracker Barrel is great for breakfast but lunch and dinner meals have been a disappointment. However, the price is reasonable so I can’t complain there but the meals to me taste reasonable….not great. My daughter works there and the mashed potatoes are made from scratch everyday.. They don’t make them like this anymore. I ordered them this past weekend and they are using instant now. What a disappointment. Not sure I follow the description correctly. It says we should bake, not boil the potatoes. The recipe directions only call to drop potatoes in boiling water.